If Elmer Keith had put a 90 degree bend in the barrel of a SAA and claimed it was better suited for shooting around corners, many on this forum would be applauding him for his visionary innovation...I’m with Dandak on this one, that gun is plain “ruint”. Joel6180 and dandak like this. Hard to imagine that 100+ years ago someone would purchase a Colt SAA and not be aware that they were ruining the future value for collectors when they used/modified the weapon. Wonder if in the next 100 years people will be cussing the "Bubbas" that are today modifying Glocks? This whole historical collector phenomenon is a one generation event. I started collecting guns in 1963, and even that late most all old Colts and Winchesters were cheaper than modern shooting guns. 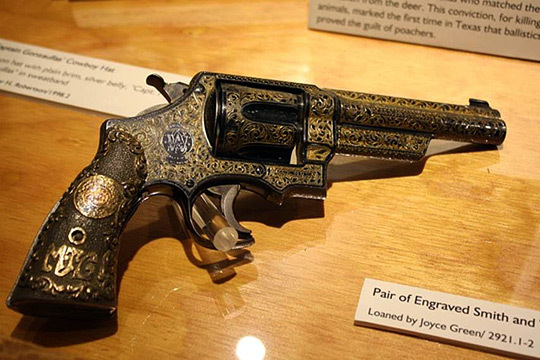 Western movies spiked the prices on Colts and Winchesters, but buyers paid more for new made guns than old/antique guns. Why buy an old worn gun when you can buy a brand new one like it from Colt or Winchester was the sentiment. For the most part, those of us spending a lot of money for antique guns grew up in the Western movie/TV era of the 1950s and 1960s. A few younger buyers show an interest, but they are a very small minority of young gun buyers. I go to many gun shows and frequent many gun shops, it is easy to see who wants what, age wise. 100 years, you do not have to look that far. Those of us on the top end of current antique buyers are dropping off every year. Young people see guns as functional tools. As the I-Phone Babies grow, they are not going to develop a love for the Old West and it's artifacts that they were never exposed to in the media and social experience. I-Phones, computers, social media, they do not care what happened in the past, they are only concerned and interested in the present and the future. Antique/historical guns will go back to what they were 70+ years ago, or less. A product for a small niche group of hobbyists. There will be the same number of old Colts and Winchesters, but far fewer people interested. Same supply, less demand, prices will plummet. Wait a generation or two, you will find me prophetic. Of course most of us will not see that, just like the few collectors 70+ years ago could never imagine what antique Colts and Winchesters are selling for now. hearsedriver, cloverleaf, azshot and 5 others like this. johnh, its already happening in the vintage guitar market. Kids aren't taking guitar lessons anymore. There are no guitar paying idols anymore. I agree with you on the Colts/Winchesters. I am already seeing more of them at gun shows than I did 10 years ago. Prices will start to drop in the next few years and collections flood the market. Perhaps next to the Colt M1911 45 Automatic, the Colt SAA must be one of the most screwed-with pistols of all time. I recall a crazy article in a Guns or Guns & Ammo magazine in the 1960's which tooted the virtues of making a Colt SAA into a shotgun revolver. Ream out the rifling to make it a smooth bore and fire 45 shot shells at clay targets. Absolutely Nuts! It's a wonder that any old Colt SAA's have survived in somewhat original condition to this day. American Rifleman from 1930. Almost 90 years old so I am pretty sure I am not violating copyright laws. Talks about the 'slip gun' where you take the trigger out. Yikes. Big name writers are endorsing it. All the rage. Ok, if you say so. Look at the hammer modification and the mainspring modification. Any concerns about safety then? 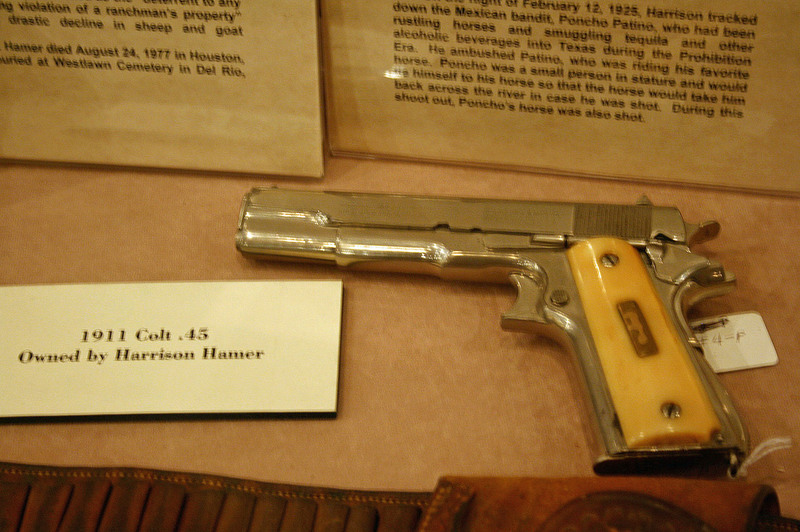 I have read that Ex-Texas Ranger Bass Outlaw carried a short-barreled Colt SAA with a slip hammer (and no trigger). This was a hide-out gun. He died a miserable death in El Paso in 1894, the result of a drunken shooting in one of the saloon & brothel districts. This was actually the intent of me starting this post here....not a debate of a bubba definition or the tools vs collectable debate. I often hear at gun shows when seeing a non factory alteration that look terrible "Now why in the hxxx would anyone do THAT to this gun?" always said in a disgusted voice. I know because I too say it when seeing stuff like this. 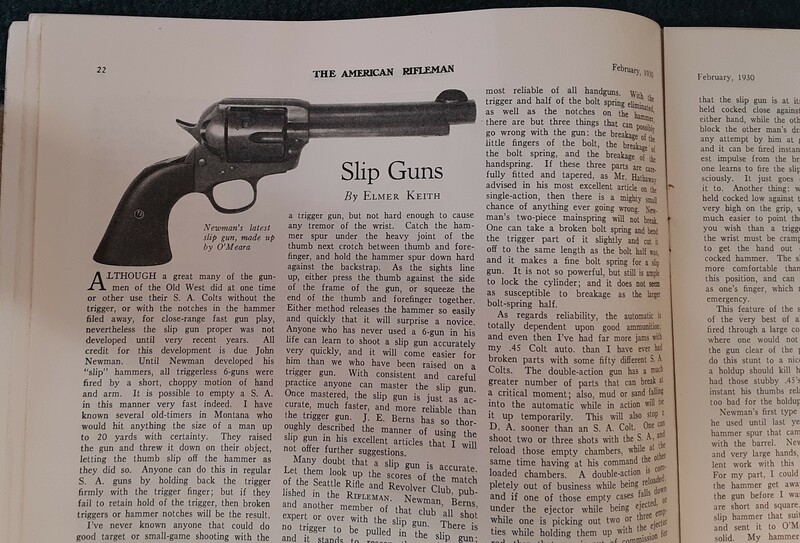 Well, when going through the 1930 American Rifleman I said "Ah Ha...here is why they did such butchery to these guns" and thought I'd post it here. Im not talking about taking a 1903 Springfield and turning it into a beautiful Sporter, that is understandable. Its understandable someone cutting an inch or two off of a 7 1/2" SAA back in 1930 to make it more manageable. What is not understandable to me is doing what was shown in the picture to these SAAs. A perfect example of "just because I can do something does not mean I should do something". You could never show anything like that now a day's because of our frivolous lawyer riddled society. Frank Hamer's brother Harrison would probably disagree. Have you never heard of slip-hammering? Ever tried it? This stuff was done by folks who were regularly involved in gunfights or trick shooting. Not collectors worrying about putting a scratch on their play-pretties. These were tools and their lives were dependent on them. These men did whatever they thought might gain them an edge. If that meant chopping off a triggerguard or a stock, that's what they did. 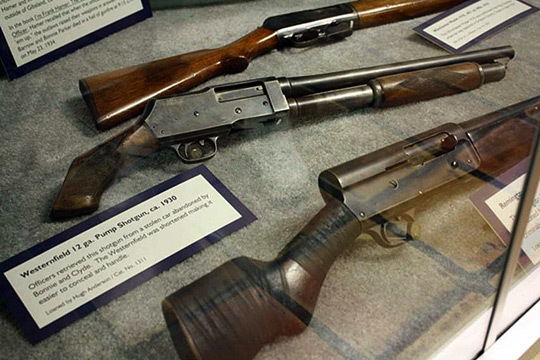 The various museums featuring guns of Texas Rangers and other lawmen of the time are full of modified guns. I'm sorry but the issue here is not what was done to the guns but your lack of perspective. BoSabbath, 29aholic, BigMuddy and 1 others like this. Today we have a handgun market with an incredible number of choices. As late as the 70's if you wanted a compact auto a visit to a gunsmith like Swenson, Sheldon, or Behlert was required. 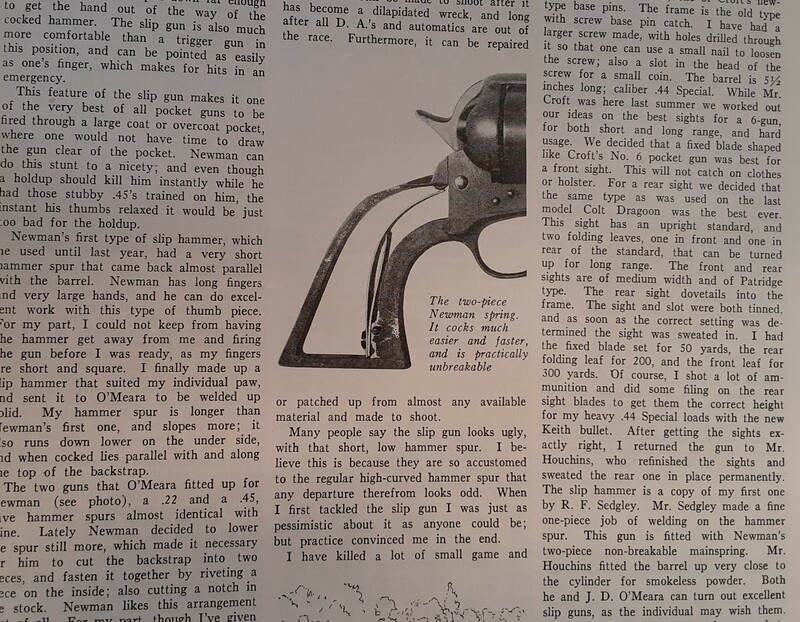 George C. Nonte wrote articles for DIYers on how to chop and channel 1911's and his favorite S&W Model 39's. Gunsmiths were also chopping N frame S&W's down to smaller sizes. Today this all would be considered sacrilege, back then they were just meeting a demand. Times change. What was the most produced or most popular Colt DA revolver in the depression era. Why? Why? Why? Omigosh! Why?